The fear of having a Russian puppet state south of the border may sound a tad Cold War-esque, but local media worry the possibility is real. For several weeks, Mexican political gossip columns have been abuzz with talk of Russian interference in the general election scheduled for July 1. Mexican political gossip columns have been abuzz with talk of Russian interference in the general election scheduled for July 1. Mr. McMaster did not elaborate on what those Russian efforts to meddle in the election might entail, but his allegations quickly spurred furious debate among Mexico’s chattering classes. Most notably, in a column on Jan. 15 in the national newspaper El Universal, journalist and commentator León Krauze wrote (translated from Spanish) that “it was called to attention some time ago,” alleging that the National Electoral Institute (INE) is aware of the Russian influence, even if the federal election watchdog has not commented on the issue publicly. The fear of Russian meddling in the election is hardly surprising because much is at stake when Mexicans go the polls. The country will elect a new president and more than 3,000 other officials, including federal senators and representatives and several governors. The ruling Institutional Revolutionary Party (PRI) of President Enrique Peña Nieto, who is constitutionally barred from re-election, has been plagued by corruption scandals and is held responsible by many for the recent surge in violent crime—as well as sluggish economic growth and increasing inequality. In the most recent polls, PRI candidate José Antonio Meade trails a distant third in the polls, behind populist leftist firebrand Andrés Manuel López Obrador of the Movement for National Regeneration (Morena) and conservative Ricardo Anaya of the National Action Party (PAN). Leftist candidate Andrés Manuel López Obrador has been dubbed “Andrés Manuelovich”; he has brushed off the accusations with jokes. After two failed attempts in 2006 and 2012, Mr. López Obrador, a former mayor of Mexico City, appears better positioned than ever to win. His platform, a mixture of anti-corruption and social welfare proposals laced with nationalism, has provoked fear and hatred from conservative forces in the country. For more than a decade, PRI and PAN officials have described Mr. López Obrador as an ideological peer of Venezuela’s late socialist president Hugo Chávez. They have invoked apocalyptic scenarios of Mexico becoming a copy of Venezuela, a regional neighbor that in recent months has virtually collapsed under hyperinflation, recession and authoritarianism. Mr. López Obrador has become associated with the accusations of Russian meddling. According to his critics, the anti-globalist would perfectly complement Russian President Vladimir Putin’s attempts to undermine the United States. 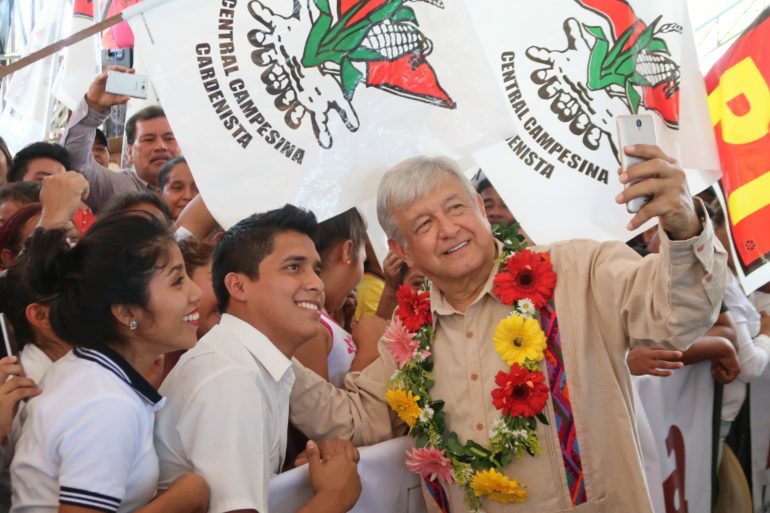 A Mexico led by Mr. López Obrador, they argue, would be less friendly toward its northern neighbor than the free trade- and business-friendly PRI and PAN. As evidence of Russian interference, critics of Mr. López Obrador have focused on John Ackerman, a U.S.-born academic and longtime supporter of the candidate. Mr. Ackerman’s wife, Irma Eréndira Sandoval, is one of the country’s leading anti-corruption experts and was recently announced as Mr. López Obrador’s pick for comptroller general, should he win the election. Mr. Ackerman himself contributes weekly video-columns to Russia Today, a television network funded by the Russian government that is often accused of working as a propaganda channel aimed at destabilizing the West. But he has vehemently denied being a promoter of Russian interests. “I express myself with total freedom about the most important political issues of the day and emphasize the need to consolidate democracy and end corruption in Mexico,” he wrote in a Jan. 25 essay in The Nation, adding that he believes the accusations against him are a part of smear campaign against Mr. López Obrador. The Mexican government already pushed back against the charge of Russian interference in the election. “Mexico has no evidence whatsoever to validate that hypothesis,” Foreign Minister Luis Videgaray Caso said on Nov. 17, after meeting his Russian counterpart in Moscow. Mr. López Obrador, meanwhile, has brushed the accusations off with jokes. On Jan. 18, he released a video in which he looked out over the harbor of the city of Veracruz, saying that he was waiting for a submarine with Russian gold to arrive. Indeed, other than references to Mr. Ackerman and Russia Today, little convincing evidence of a Mexico effort by the Russians has been made public. In the United States, the extensive use of “fake news,” articles planted in social media to help sway public opinion in favor of Donald Trump, was widely reported after the 2016 election, but so far no such operation has been revealed in Mexico. “I don’t see how Russia would interfere in Mexico, to be honest,” Rodolfo Soriano-Nuñez, a Mexico City sociologist, told America. “There are important differences between the United States and us. In the U.S., for example, you only have to sway elections in certain states to influence the final outcome, but in Mexico it doesn’t work that way. The Mexican version of “the Russia story” is not likely to die down as the presidential candidates begin their campaigns in less than two months. But skeptics of the suspicions, like Mr. Soriano Nuñez, do not believe the coverage will ultimately play too much of a role in the election. Now that the Russian collusion story in the US has proved to be the fake news story of the century, let's move it south of the border. Maybe the FBI will interfere in the elections or the Democratic Party will find some way of getting Mexicans to vote for them.